I’m used to coffee being sold on the origin of the beans, so I was momentarily confused when I first saw this weeks coffee. Italian coffee? Do they have the climate? 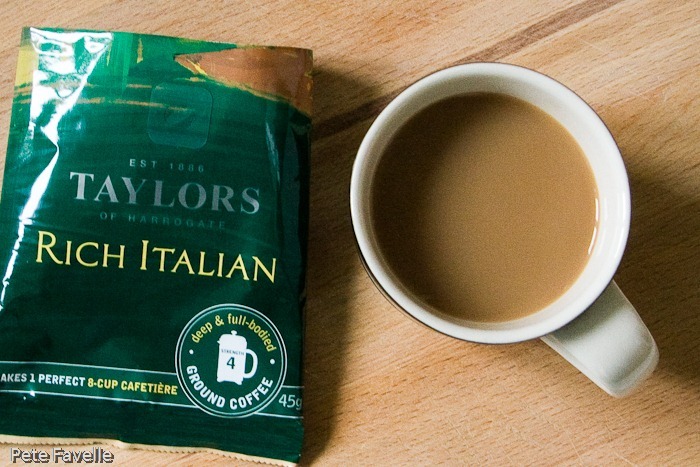 This is Taylors Rich Italian, and of course reflects the Italian style of roasting and blending, rather than where the beans were grown (in this case, a blend of Latin America and Africa). The grounds certainly have a rich aroma – warm, caramel, an edge of singed bark chips and just a hint of lemon. Brewed, it becomes a little darker – the caramel becomes more of a burnt sugar and the fruit background is closer to sour cherries. In the mouth, it certainly manages to bring that Italian style – heavily roasted, with a generous body and quite a significant bitterness to it. The sweetness from the aroma doesn’t really come through, but it’s warm, delicately spicy and almost creamy. If you enjoy that style, it’s a great coffee. For my tastes, I prefer the balance to be a touch less bitter but it scored a respectable 6.75 in our work coffee club, and deserves 3 stars here. 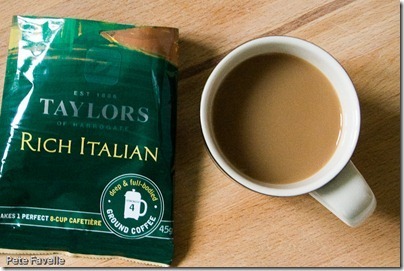 Many thanks to Taylors for supplying this coffee to sample.